Don't just settle for blending in with the crowd! and build relationships with clients. Don't waste time trying to figure it out on your own. Let me take your ideas and make them work for you. Do you need a web presence? Have you been wanting a website but just can't seem to get it moving? Don't even know where to begin? Don't know the secrets of a good website? You're in luck! I do! Your new website will display your service/product and convey your story in a way that makes it shine! Visitors will be drawn to items that speak to them and they will want to know more. You will be able to share your knowledge with existing and prospective clients who will want to engage with you. You will offer a unique online experience that truly conveys your message. We will begin with a consultation so I know what your needs are in a website. This process will help me understand your brand and I will give you tools to gather the items that we will need to begin the project. Then, either taking your existing brand or using my branding expertise (see branding packages), I'll develop a web style that attracts your key clients and encourages them to take action or make a purchase (if we decide you need an e-commerce site). I will set up all of the technical stuff (hosting, security, SEO, etc. ), put the visual magic in place, and make it look amazing on desktops as well as mobile devices. When it's all ready, we'll launch your new site with a BOOM! You'll need some sort of maintenance for your site to stay secure and running well. This package includes the first year Basic Maintenance Package ($780 value). After the first year, you can either maintain it yourself (training available) or you can continue with a maintenance package and I'll take care of it for you. 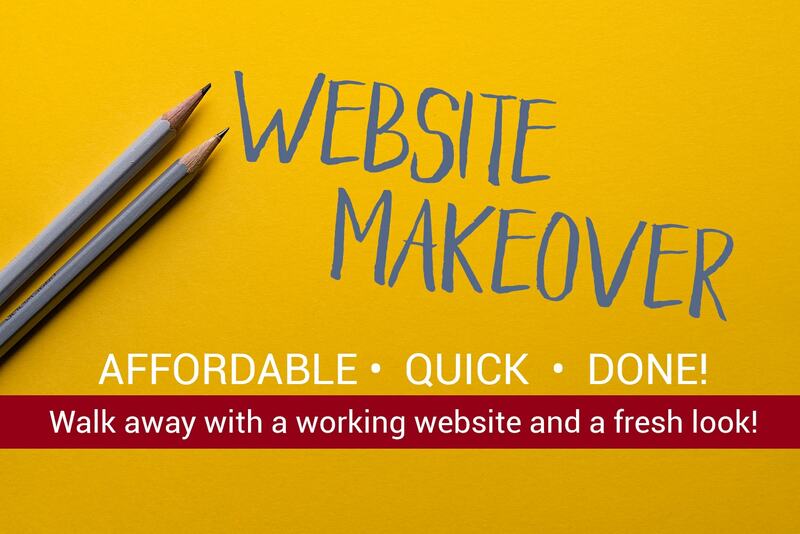 Get a website makeover without the high-end price tag. You can still have a nice looking and effective site with my Website Makeover Package. Click the button for more details.